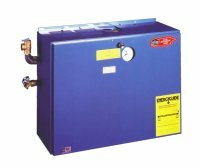 The e·f·m eb4 is the Electric Boiler that makes installation easy. Perfect for any heating application where a chimney is not available, for supplemental heat or where other fuels are not practical. Now available in a special contractor configuration with lower cost and more options. Best of all, the eb4 comes with all of these features standard to minimize installation time and result in a finished appearance. The temperature pressure gage is factory mounted on the heat exchanger and visible at all times through an opening in the jacket. The readings are at the heat source, not down stream. The circulator and flanges are factory mounted and inside of the jacket. The circulator is also pre-wired. The heat exchanger includes a built in dip tube design for air elimination. There is no need to pay for or install a separate in-line air eliminator. The air vent is included with the boiler.